St. LOUIS () -- As Diwali comes to a close, reports of gold jewellery demand in India by the World Gold Council (WGC) conflicting with import figures from the Bombay Bullion Association, which maintains the records of gold and silver imported in India, may show that Indian gold buyers are shifting to investment in coin and bar form from traditional jewellery. Today, Suresh Hundia, President of the Bombay Bullion Association, estimated that in the month ahead of October 21, the date of the Diwali festival, imports of gold rose 123% to 156 tonnes from 70 tonnes in the month before Diwali last year. And just last week, India's largest bullion trader, state-run MMTC Ltd., announced it had imported 60 tonnes of raw gold between April 1 and October 15 in anticipation of India's festival Diwali - up 33% over the corresponding period last year. According to other reports, jewellers across the country are expecting gold sales for Diwali, known as the "Festival of Lights," to rise 25%-30%. As the world's largest consumer of gold jewellery, India imports roughly 800 tonnes per year and the demand peaks during Diwali. According to WGC, jewellery demand has accounted for 77% of total gold demand since 2001, and was worth some $40 billion last year alone. In the "Gold Investment Digest," WGC reported that the value of gold jewellery sales rose to a record $11.4 billion in Q2. However, sales volumes fell 24% year-on year in volume terms, and jewellery demand in India alone fell by 43% year-on-year. WGC attributed the drop to price volatility in the second quarter, where gold traded in a range of $567/oz to $725/oz, "which is exceptionally wide for gold." But according to WGC, the long-term outlook for jewellery demand remains positive "thanks to a combination of rising wealth levels, favourable demographics and attitude changes in the world's major gold consuming countries." Paul Walker, President of GFMS, the gold consultancy firm who supplies the data for WGC, told RI there is a major secular shift to investment in coin and bar form from jewellery in India. He said "these two categories are out performing jewellery and have done again in Q3." Some say that Indian investors are growing more concerned about the quality in gold jewellery due to the lack of hallmarking in the country. Indian generally prefer a higher quality of gold than in the U.S. and Europe. MMTC to open 10 new hallmarking centres across the country. At present, India has 39 hallmarking centres, including one owned by MMTC in New Delhi. WGC noted that India accounted for no less than 43% of global retail investment demand in Q2, which includes bars and coins, rather higher than the typical 35% share, based on ten years of annual data. "Indian appetites for gold investment have grown in line with incomes but also, importantly, in response to deregulation and improved distribution networks as a number of retail banks now act as outlets for small bars and coins," wrote WGC. James Turk, chairman and founder of GoldMoney.com, told RI that Indian demand for high-karat jewellery and bars, which are "purchased for monetary reasons, and not for adornment," is soaring. Turk said he just returned from an investment conference in Hong Kong, where Indian speakers confirmed that demand for bars and high-karat jewellery was strong. Gold analyst John Brimelow said that even with a big drop in jewellery demand, imports may still be needed if local scrap supplies are sluggish. He noted a big upturn in Indian bar and coin demand as well. "Indian imports fluctuate wildly primarily governed mainly by price. They can change dramatically overnight. Apparently this latest boom started in late August," said Brimelow. But Jon Nadler, analyst for Kitco.com, asked what will happen to gold's current support after the wedding and festival season comes to a close? "We alluded last week to the troubling prospect of Indian gold gifting season drawing to a close as gold was finding precious little support in other areas. Now, it has come down to the tail indeed wagging the dog," said Nadler. Brimelow said he doesn't buy the assertions that the end of the Diwali festival will cause a collapse of Indian buying. "In fact, right through to January is prime buying season for India, which for the last several years has exerted most influence over world gold at this time," he added. He said the fact is that gold broke badly on the AM fix this morning suggested the presence of a significant physical seller, adding that "someone has had to supply India all that gold." Gold futures closed down $13.50, or 2.3%, at $582.90 an ounce on the New York Mercantile Exchange. On Friday, the contract lost $6 of its value, even though it amassed a modest gain for the week. Nadler said last week that if and when prices penetrate strongly over $600/oz, the mood would surely improve and we might even achieve the forecasted $620 average for the year. "The trouble, however, continues to be the repeated failures and pullbacks we witness at higher levels," he added. Nell Sloane of NS Futures said today that the gold market is lacking some of the recent physical buying interest support that has periodically been present over the last two weeks. She added that "it is possible that the bear camp will feel more confident in pressing prices." Brimelow said for the next couple of days, with Diwali and also the conclusion of Ramadan, the bears have something of a respite from the discipline of the physical market. 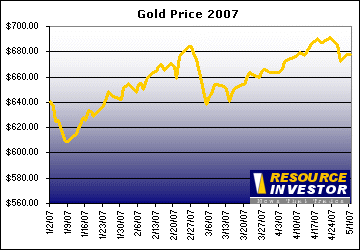 "But the lower they force gold the stronger will be the inevitable response," he concluded.